Part numbers for the mufflers are different. If you look at the part numbers for each you will see that they are different. Exhaust - 92-94 (early) are all similar. A 95-97 (later) will work but you will need the same year range header to go with the exhaust. The only difference is the location of the bolts at the flange that connects the pipe to the header. The early bikes are rotated 180 degrees from the later ones. You can physically mount a later exhaust pipe to the earlier header, it will be rotated slightly causing the angle of the exhaust tip to be different. For the rear under tail. The plastic part is different for the early and later bikes again. Either will work on your bike. You will see the differences in the area where the battery and the electronic control mount under the seat. From the exterior of the bike they will look the same. This will be a hard part to come by. I would not hesitate to grab either style. This question will be if you are going for a stock appearing restoration or a completely stock restoration. Yes completely stock if possible but your correct the rear under tails hard to find and everyone of them has been cut that I have found so far! Thanks for this very useful information. 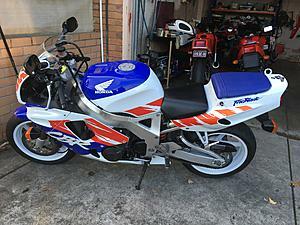 Quick Reply: 92 fireblade back to stock?